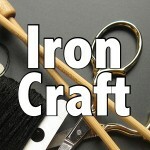 This week’s Iron Craft theme is Summer. Here is Minnesota one of the things we look most forward to all summer is the State Fair. I don’t spend too much time on the midway, but I love the look of the rides silouetted against the sky. 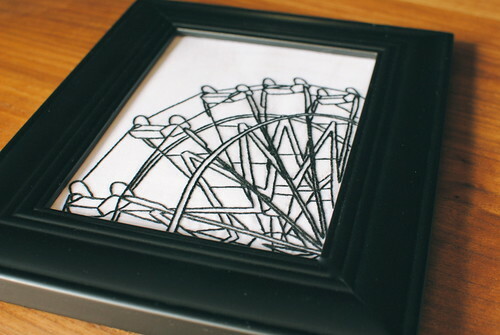 For a long time I’ve thought the lines of a ferris wheel would make a great embroidery piece. This challenge gave me the perfect excuse to try it. 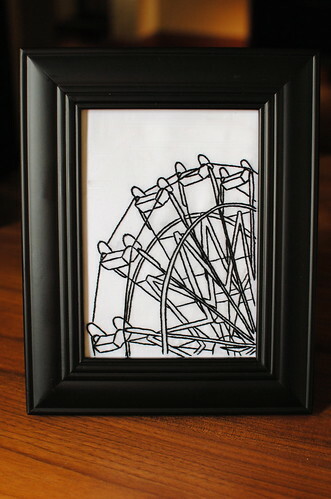 Plus, we are redoing our downstairs bathroom in all black and white which means it will need some new art. I like to decorate with my own pieces as well as those I pick up from other people. I’m pretty happy with how it turned out. Even though it looks like a lot of stitching it really only took me a couple days to finish it. Drawing the pattern took almost as long as stitching it. I’m tempted to paint the chairs with silver fabric paint, but I’m not sure it that will enhance or take away from it. Thoughts? Later today I’ll post the pattern for those who might what to try their hand at it. 8 years ago by Kat in Challenges , Embroidery , Iron Craft , Needlecraft | You can follow any responses to this entry through the RSS feed. You can leave a response, or trackback from your own site. I like it as is, but can see the appeal of adding something shiny since I like shiny things. 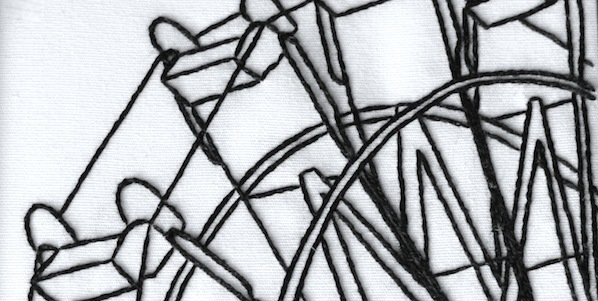 What about a few of strategically placed stitches of shiny embroidery thread instead of paint? I am big fan of the monochromatics, so if you do decide to paint it I would only do the bottoms and sides of the cars. Another alternative, which could be very eye catching is to do just one of the cars with paint. Silver on the outside maybe and something super fair like on the inside (like a bright red). The one spot of color could make the entire thing pop. So cool. I love it. SO should we be posting our challenge today or tomorrow. SOrry I am so confused. It could be the fact that I did not sleep much last night. I love your embroidery! I have a collection of monochrome on my hall wall, this would make a brilliant addition – thank you for sharing the pattern. Love the pattern and your stitching is exquisite. Thank you for sharing! Did I miss the pattern? I would give this a go … and like it as-is. Stunning.